Ceviche is a classic South American dish that comes from the west coast of South America. 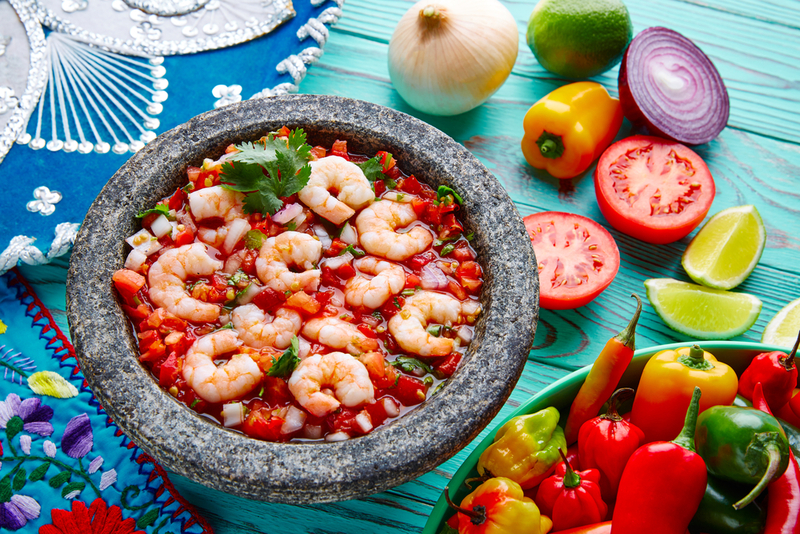 There is much debate as to where the dish originated, Mexico, Peru and Ecuador all claim it – but perhaps the country that is known best for this dish is Peru. Ceviche is made from a combination of raw fish that is left to sit and cure in lime or lemon juice. After allowing the mix to sit for around 10 – 30 minutes (depending on the dish) sliced onion, garlic, peruvian aji (or yellow chilli) and coriander is added. In some countries, tomato, corn or even avocado is added to the dish. Due to the fact raw fish can lead to food poisoning it is usually prepared on the spot, and a popular dish for lunch and not dinner stems from the years prior to refrigeration existing, for obvious reasons! According to Peruvian chef and food expert Gaston Acurio – Lima for many years was famous for dishes such as ceviche, and through the trade routes of the early colonial period the dish spread throughout Latin America, and now enjoys the popularity throughout the world of gastronomy that it does today. Lima, the capital of Ceviche. Photo credit: Shutterstock. Sea Bass, Sole or Prawns? 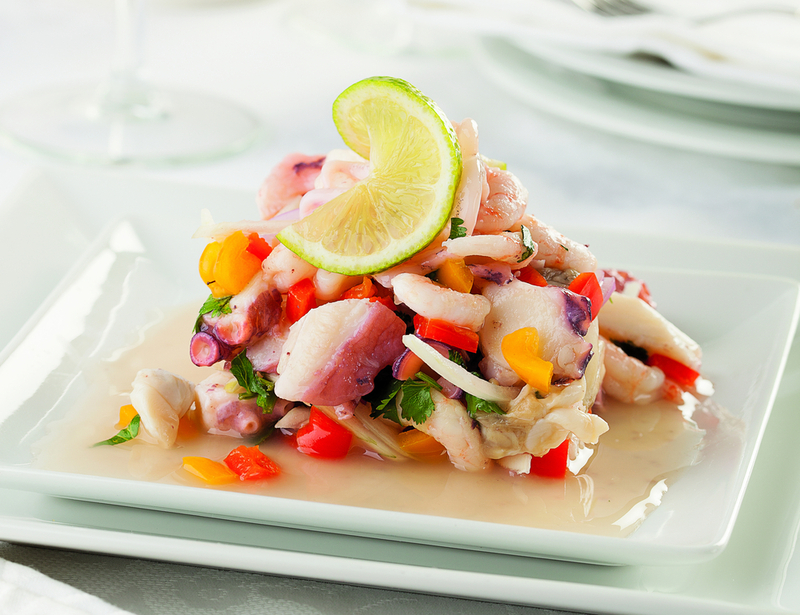 Ceviche is commonly made with fresh fish, and in Peru the most common fish used include Sea Bass and Sole. It can also be made with grouper. In Australia, many Peruvian restaurants find Flathead or Pink Snapper the best ingredients coming Australian waters. Whatever seafood does work with Ceviche, and you can also mix it up with octopus, prawns, squid, shellfish or whatever takes your fancy. Ceviche can be served with lettuce and sweet potato on the side traditionally in Peru. It is also sometimes served with dried corn kernels (which are fried) and called canchita or in the Northern coastal areas with banana/plantain chips. The leftover jugo (or juice) can be served in a small glass and is called locally as Leche de Tigre (or Tiger’s milk) and renowned in Peru as a potent aphrodisiac. We totally recommend you try this Peruvian speciality and other Peruvian seafood in general on your next tour to Peru, it is a wonderful dish and there are a host of fantastic restaurants to try it. Lima is the world capital of Ceviche. In many coastal towns they will make it for you on the dock, where they bring in the fresh fish. Some great options in Lima include La Mar and Pescados Capitales, another good option is Punto Azul, which has various locations across Lima and always popular. Check out how to make Ceviche on this cool clip with Javier Wong, one of Peru’s masters. 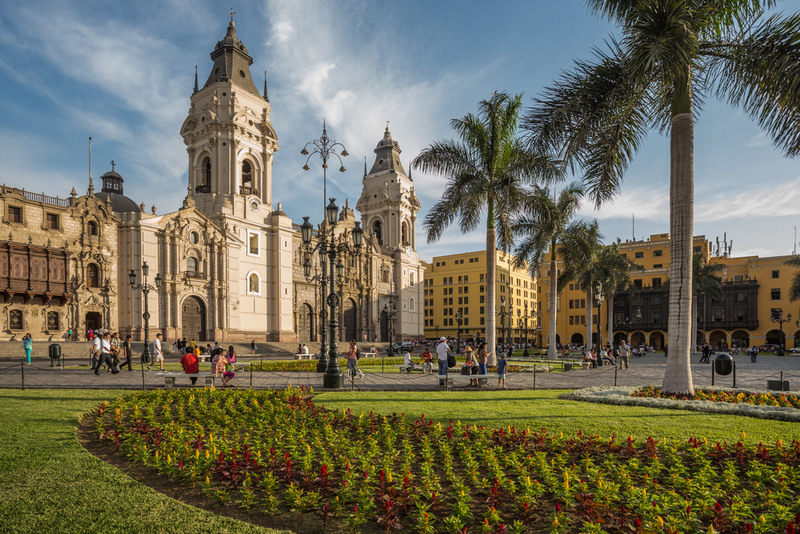 Check out our guide to Peruvian food and gastronomy tours sometime or if on a quick visit have a read of our blog on 48 hours in Lima.. Here at Chimu Adventures, we pride ourselves in offering a host of sensational tours to Peru, including mouth-watering food tours. Call us today and let us design a tailor-made itinerary to suit your budget, taste buds and desire for comfort, and we’ll take care of the rest. This tour will have you tasting the diversity Peru has to offer whilst exploring the highlights of the coast and the Andes.